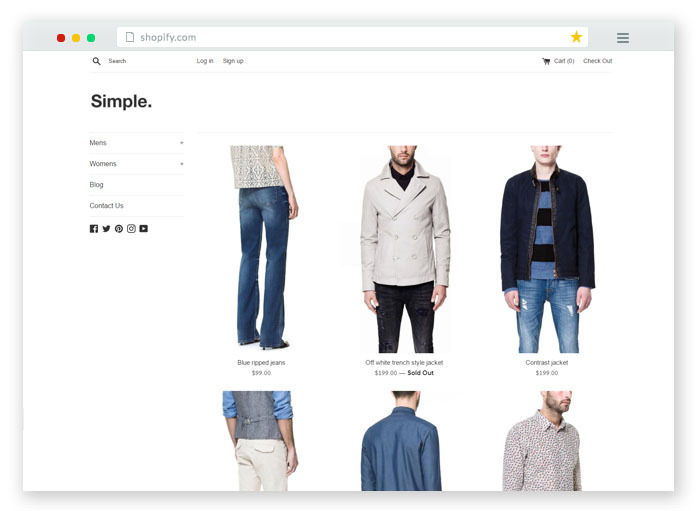 Shopify is an eCommerce platform that helps small merchants to easily set up online niche stores professionally and also one of the number of services for doing so. Shopify has partnered with hundreds of different vendors to ensure you have a seamless experience offline and online. 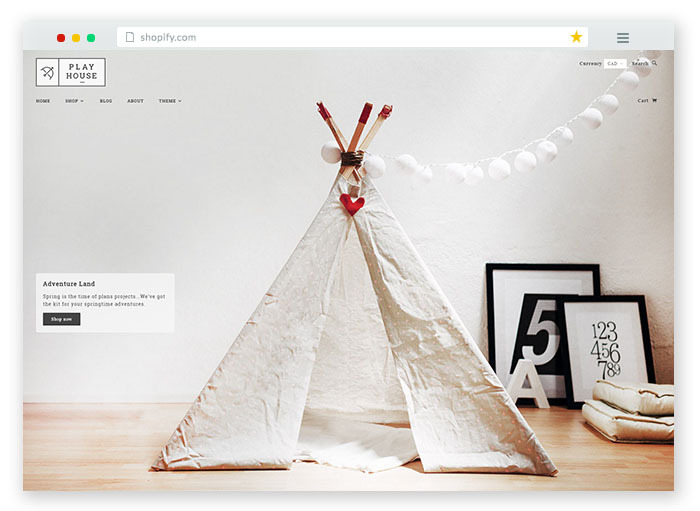 The Shopify themes are well optimized for search engine ranking and mobile friendly in design. From creating your first product to shipping your 10,000th order, the Shopify Manual has everything you need to know to build your Shopify store and keeping it in tip-top shape. Every website template comes with its own settings so you can quickly and easily customize your website’s design. It’s quick and easy to choose a template, add your products, and begin accepting orders. Shopify keeps track of all of your products and their inventory on your products page. 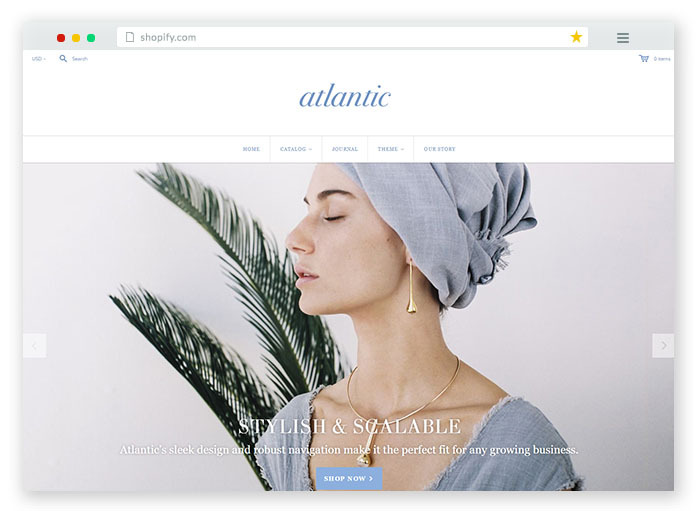 Administer through your products with these best Shopify eCommerce Themes which are scalable to multiple devices as they are responsive. 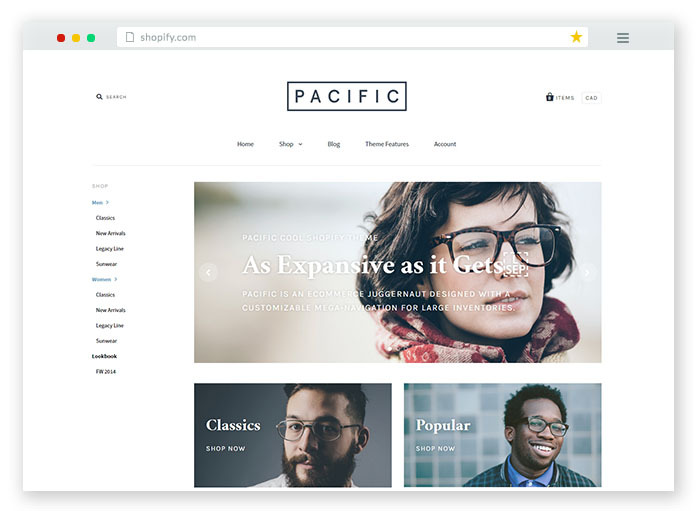 Find more awesome shopify themes here and don’t forget to check our new topic on 10 Best Free WordPress eCommerce Themes. 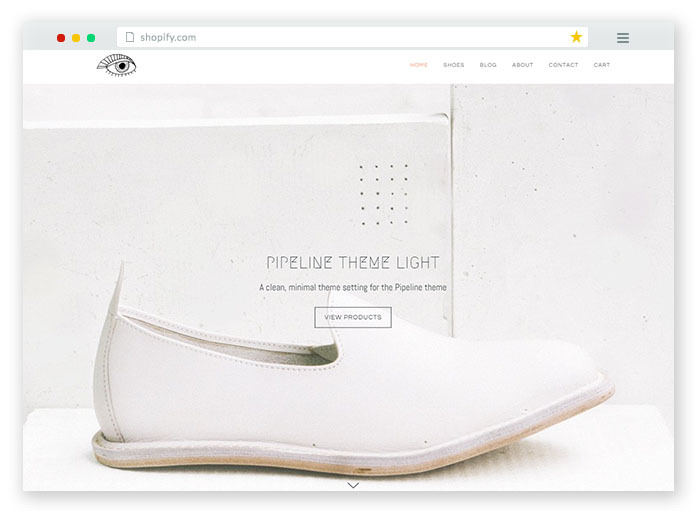 A simple free eCommerce template by Shopify themes to display your brand products in style. 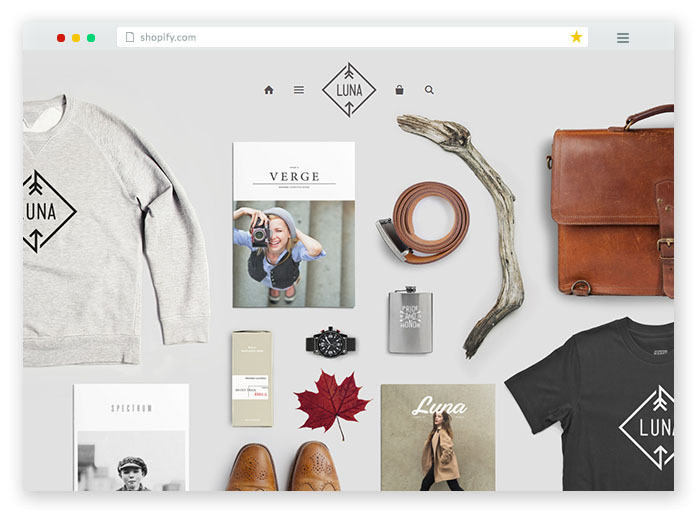 Organize a crowdfunding campaign with this eCommerce website template made free by Shopify. Easily give your Kickstarter campaign a powerful e-commerce store. 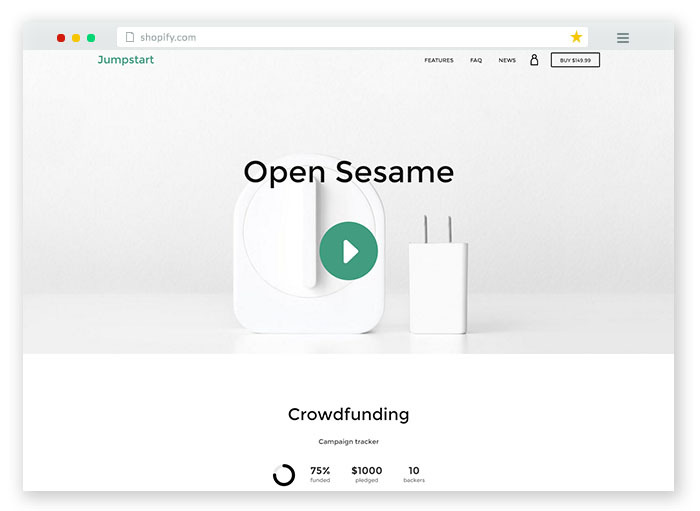 Jumpstart is an absolutely free theme and is made specifically for crowdfunding graduates, non-profit organizations, charity websites – it’s also perfect for selling products. A free theme for eCommerce stores to display a large number of products and catalogs online. 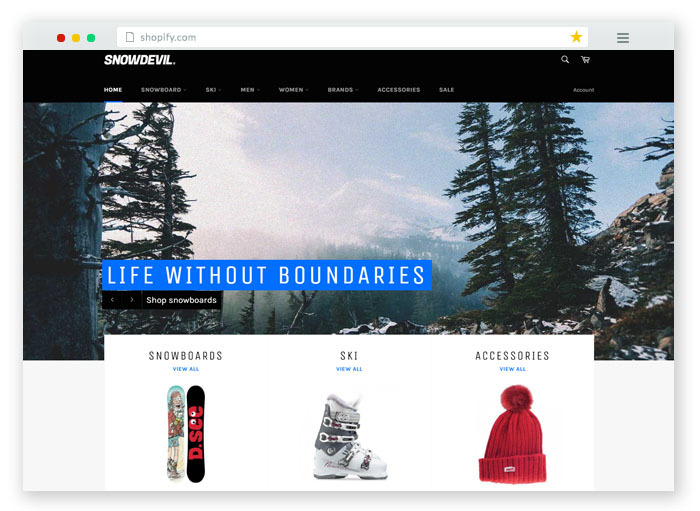 By the way, the theme reflects snowboard products and also features product filtering and slideshows. The theme here will help you build an online shop for selling stock photos or anything related to photographers and fashion photography studios. This is a clean minimalistic design theme for clothing stores, men’s & women fashion stores or for any basic eCommerce store with small product inventory. The theme has responsive design and SEO friendly giving you high website rankings in search engine results. A brilliant e-commerce solution for clothing stores, men’s and women fashion apparels and more. 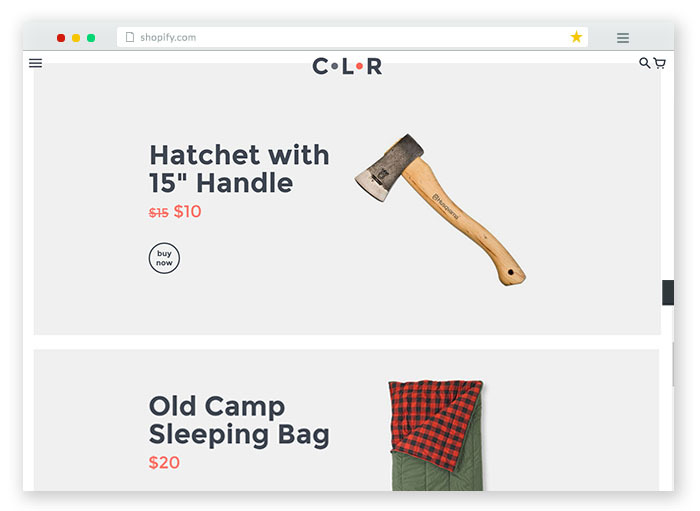 A responsive Shopify theme for brands which need a minimalistic design for their online store and like to list only a few top of the class products. A slide out cart system will keep your customers on the current product page. This is a multi-purpose Shopify theme with drag and drop interface and brilliant image slider plugins namely Slider Revolution. 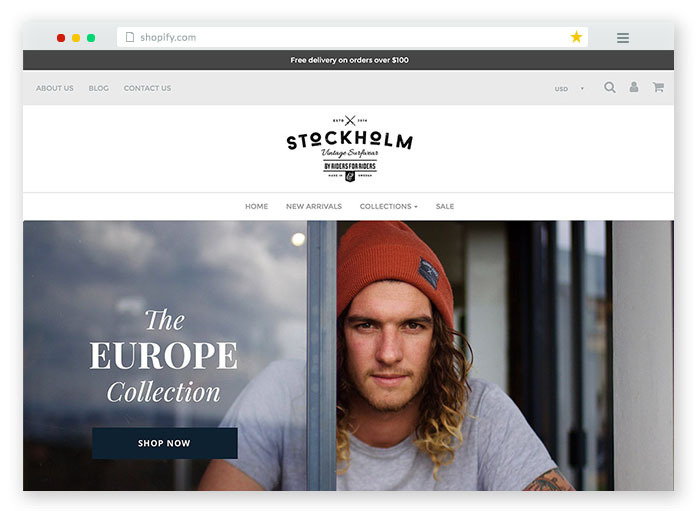 This responsive design template for Shopify is trending on Themeforest right now and is receiving high praise for its feature list. You can choose from five homepage layouts that will serve well for electronic stores, fashion store websites. The features go on starting with promotional banners, email newsletter signups, ajax search & quick add to cart, related products auto suggest, product comparison, ajax product filtering, wishlist, deal of the day with countdown timer and many others. Build a huge store online for fashion kids, mens and women apparels, digital & electronics store, grocery & walmart stores etc. 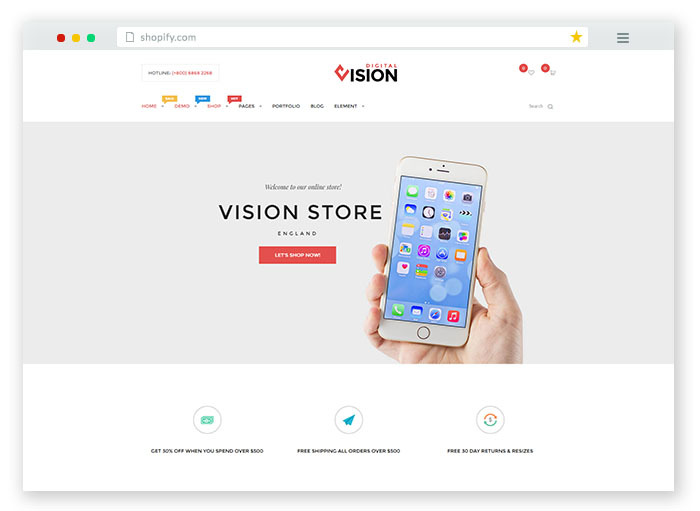 This Multipurpose Responsive Shopify Theme has fast loading times, google rich snippet support, seo friendly design and over 57 pre-built demos to quick start your website design. The theme serves the purpose of any online store with its unique blend of web elements required for an e-commerce website. The quick demo import gets you straight away access to over 57 theme demos with which you can build any store you desire. Build furniture shops, electronics stores, coffee shops, fashion shops, online medical equipment stores and almost any type of eCommerce solutions. Edition is an online store theme that is simple and elegant in design where you can feature a bookstore for photography books, home & garden magazine books or any creative works. The unique background will give your store a rustic, trendy appearance. This responsive theme looks great on desktops, laptops, tablets, smartphones or any mobile devices and comes with a wide range of excellent features including easy color, font and image customization, MailChimp integration, social media capabilities, navigation dropdowns, personal blog, payment gateways with secure checkout, customer accounts, and great support. 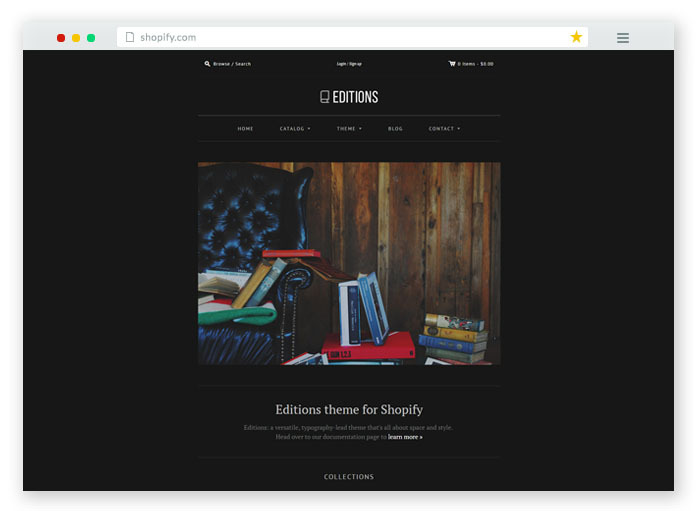 Create an ecommerce theme for author bookstores, online magazines etc. 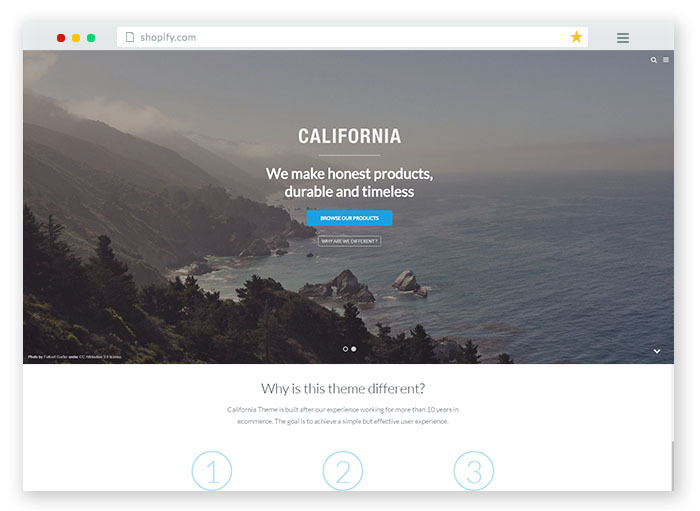 A fully responsive theme, California is a clean, sharp, minimal design offered on Shopify. 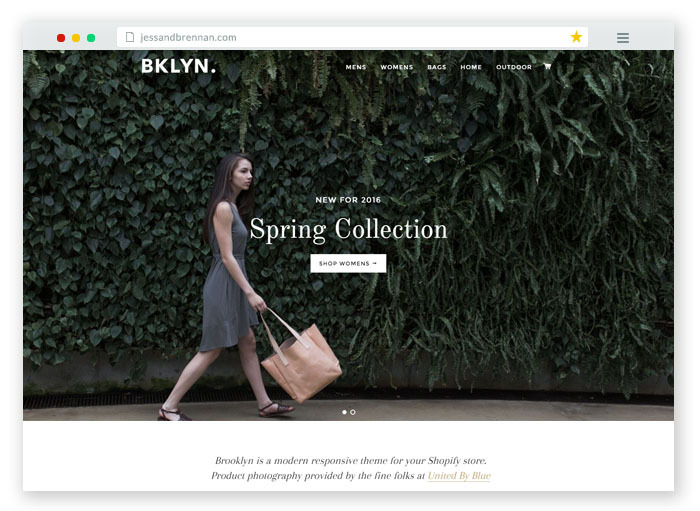 The theme store is made with brands in mind who like to sell their own products. Easily change fonts, colors and images to make it your own and benefit from other great features including its responsive design, built-in social media, seamless checkout, parallax header, product filtering, navigation menus, MailChimp integration and customer account capabilities. Build an brand specific online store for organic food products, beauty goods or even an elegant clothing store. An eCommerce website template to Stand out from your competitors with this sleek, trendy design. Luna is a responsive theme specifically designed to adapt its display on mobile devices, tablets. It’s packed with great features that you can customize according to your brand including the background layout, typography, product and collection views, navigation, color schemes and fullscreen product gallery images. Create a brilliant theme for jewelry stores, home goods & craft stores and also suitable for brands with small inventory. This premium responsive theme is designed to look at its best on any device – be it desktop, laptop, tablet or smartphone! The features are impressive starting with a mega menu for navigation and a quick buy e-commerce system. The minimal design and flat color scheme give the site a dynamic appearance and make your high-resolution product images stand out. Customize all aspects of your store including the background, color scheme, typography, shopping cart, navigation, product and collection views. 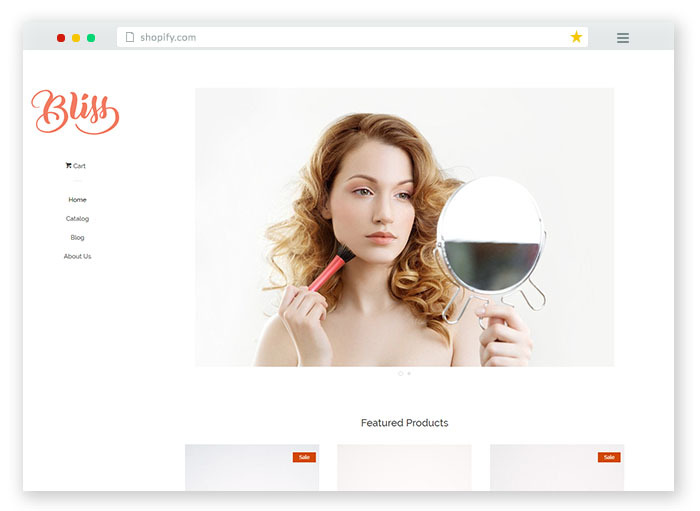 Create a Jewelry store, fashion, apparel or beauty product store, sell photography goods, flower & craft shops and more. 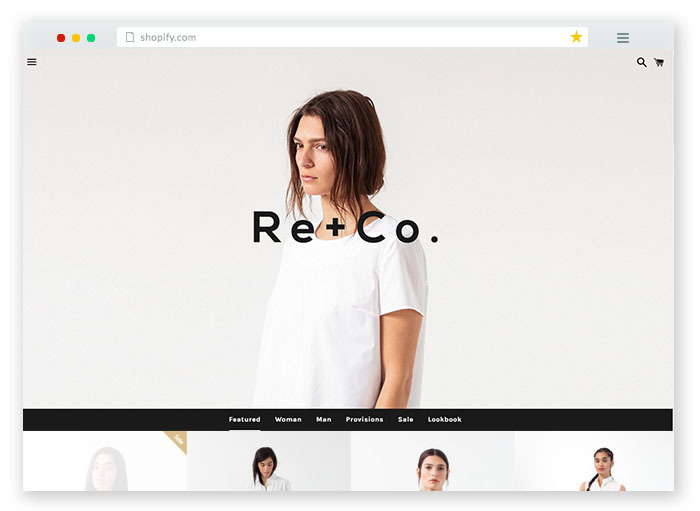 Clean, crisp and current, this is a fully responsive Shopify theme. Customize freely to make it your own with features including the homepage slideshow with video support, social sharing buttons, MailChimp integration, Google fonts, over 70 payment gateways, sidebar navigation menu, mega menus and product gallery. Build any kind of online eCommerce store may it be for Jewelry, home goods, furniture or clothing business which require a huge inventory. Parker is a premium, responsive theme made especially for the fashion business and products.With a ton of customization options, Parker lets you build your homepage with products, products images with zoom effect, integrate with social media, change colors, experiment with different typographies, edit buttons and personalize your navigation. It also has cool marketing features like modal popup window on the website to join email newsletter. 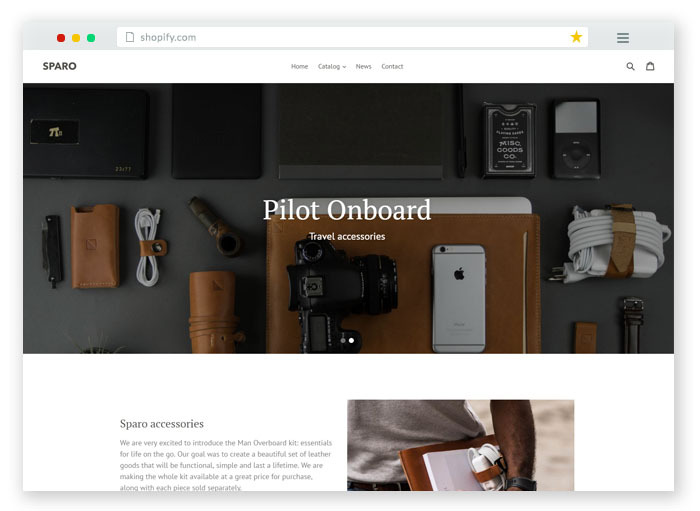 It lets you create featured products, collections and blog posts on the homepage. Build a rich online shop for men’s and women fashion apparels, shoe and sports products, kids dress etc and more. This is a responsive, highly customizable theme with striking modular homepage and easy to navigate menus. It’s super easy to change the look and feel as the whole page is modular. Add logo, change colors & typography, payment gateways, product images with ease. 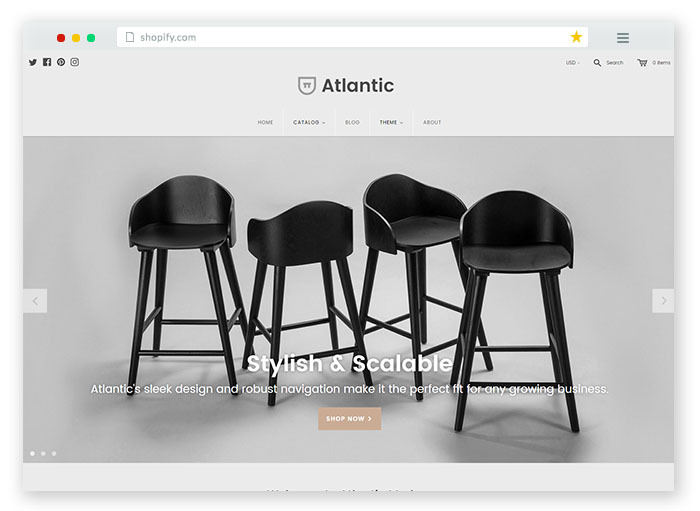 Set up a store for any type of websites like say furniture websites, beauty and fashion websites with this modern theme design. The personal blog of this theme let you showcase your articles related to your niche in a classic one column layout with a sidebar. Build a shop for brands with small inventory related to fashion, furniture or craft products. This premium theme is created for store owners & web designers who like to build a massive gift shop. It is designed to work auto-magically on desktops, laptops, iPad, iPhone & more, with a set of unique functionality & customization options that require no coding knowledge. It’s also a web designers delight of a framework, with huge potential right out of the box. Excellent support and SEO friendly website design make the theme a must have for toddler websites. 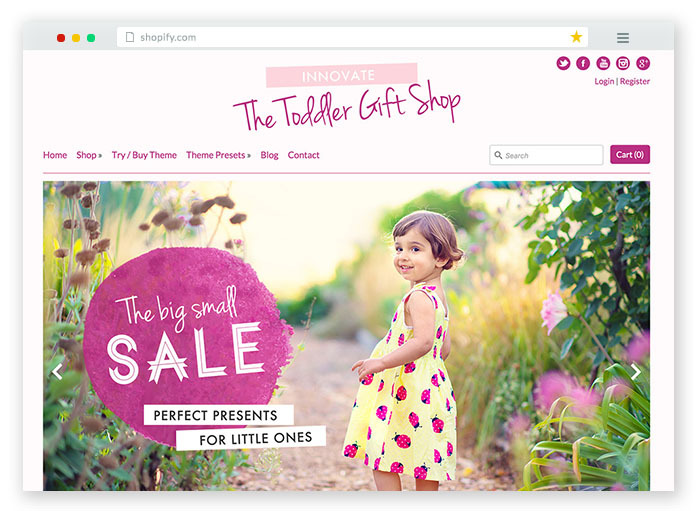 Build a gift shop, kids clothing, candy or toy store with this eCommerce template from Shopify. A theme which is exceptional fluid across all devices, Blockshop uses four rich color schemes for a dramatic effect. It lets you customize everything with this powerful theme editor panel and that doesn’t require coding knowledge. The theme is well suited to built fashion websites that need a big store and also can keep track of sales and conversions. You will get every option to add social sharing buttons, featured images with unique product displays, sidebar promotions, homepage sliders, navigation drop-down, twitter & Instagram feed and a business blog. Build a beautiful organic store for food products, music store for selling your record labels, have a boys and girls apparel store and much more. A multi-purpose theme ideal for experienced store owners and professional web designers. Customize it to the fullest with a range of capabilities including homepage image sliders, parallax effect promotion highlights, alternate product and related product functionalities, and social network sharing – all without any coding knowledge! Or, design your clients’ websites from start to finish in a matter of hours using multiple styles available with this template. The minimalistic design, when paired with a parallax scrolling effect, makes this a pure bliss to look at and its featured products. 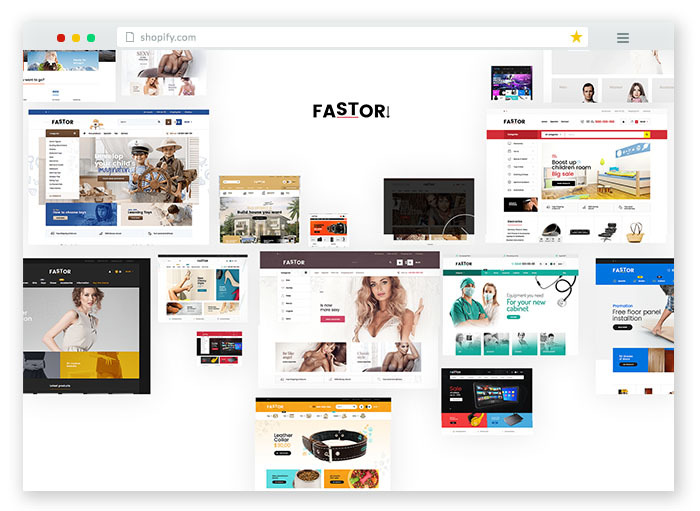 Build a large inventory for fashion stores, clothing stores, interior design accessories and even display a single product website with parallax effects. Using cool green and warm red hues, this theme gives your online store a relaxed, trendy feel. There are three styles that come with this theme download – one of the design is very minimal and appropriate for small brands with few products, the second one comes with an artistic style using the best serif fonts, the last theme style is much more cool for displaying cool products like watches, sunglasses etc. A responsive theme with an excellent display on any device featuring a visual storytelling design and a much more close focus on products. 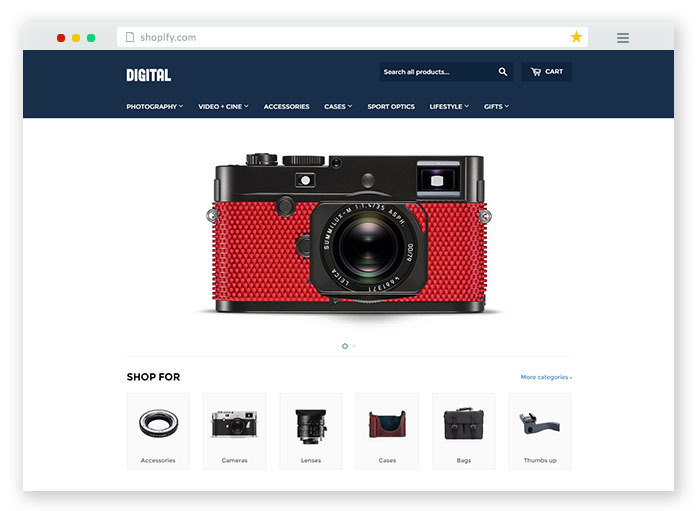 Build a single product ecommerce store with minimalistic design or even a small shop for small business. Stockholm is a professional, minimal theme, with easy to customize features. It’s perfect for fashion and luxury eCommerce labels and features enhanced social network features including Facebook commenting and product page sharing. The four pre-built theme styles will let you create much more than you can imagine. The marketing popup window, product image zoom effect, Instagram feeds, product slideshow will keep you hooked to using this premium theme. Build jewelry stores, perfume stores, yoga gym & fitness stores or brand specific product lineups. Shopify is one of the best e-commerce platforms which lets you sell your products. 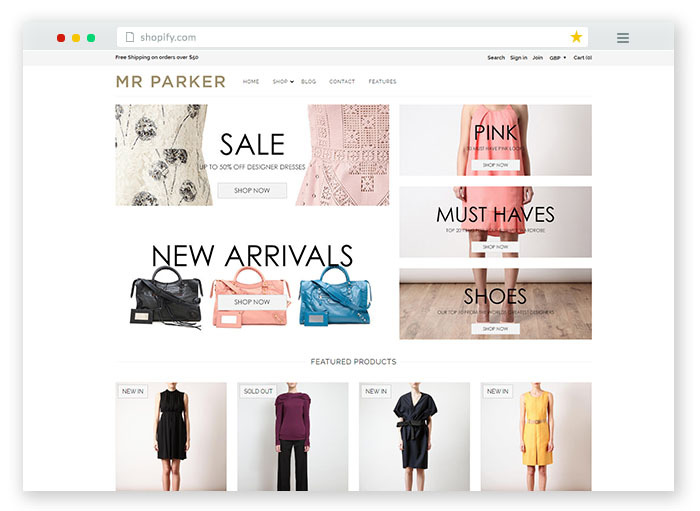 The main purpose of the Shopify e-commerce solution is to give the users the ability and customization to build their own eCommerce websites with a powerful online store solution. 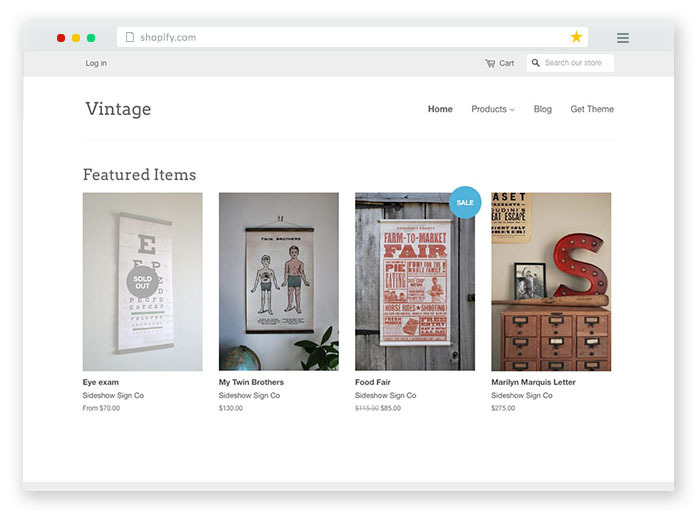 Selling physical and digital products is easy with Shopify as it gives you instant access to a range of free themes as well as premium themes upon signup. You can buy premium themes from the Shopify store or from third party websites like ThemeForest. We included some great themes from ThemeForest that are powerful for your business. Choosing any plan will give you straight access to 9 free themes and over 50 premium themes.